Renovation to plaster mouldings in a church in Bardsea, near UlverstonWilliam Wilson Architectural Mouldings Ltd are specialists in plaster mouldings restoration, renovation and repairs with over 20 years experience to our name. Whether it be contemporary, Edwardian, Victorian, Georgian or earlier we can match any existing decorative plasterwork, no matter how ornate and can also offer In Situ Plasterwork Repairs where necessary. Over the years, we have worked on a large number of fire, water and time ravaged historic buildings (many of which were listed) including private homes, churhces, town halls, libraries, museums, public schools, stately homes, hotels and even a castle or two. For listed buildings, all work is carried out in adherence (where requested by the client) with any English Heritage instructions and guidelines and with due sensitivity to the building itself wherever possible. We believe in a quality product and only ever use in-house produced Handcrafted Plaster Mouldings created to exactly match your existing plasterwork. When reproducing existing mouldings, we always clean off the layers of paint to expose a sample section of the original plasterwork to create our reverse mould from. This ensures a best match with the original, bringing out the detail to produce nice crisp edges. This means that if and when you remove the layers of paint from existing sections, the overall result will be as new / originally intended. Some firms don't do this, but we always strive for the best possible finish. In fact, we have even previously been asked by English Heritage to add deliberate and obvious flaws so that our replacement mouldings can be told apart from the originals! Our moulds themselves are made using traditional shellacking methods or where the highest quality reproduction is required, silicone rubber. If your property has been significantly altered and its plaster mouldings have been removed or replaced over the years, we can advise on restoring appropriate period styles and features. 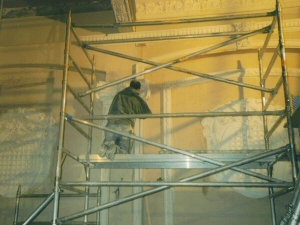 Restoring original plasterwork to Glasgow's oldest cinema during conversion to a restaurantWe stock a range of in-house produced plaster Centrepieces, Corbels, Cornices, Panel Mouldings and more to authentically recreate most period styles, including Edwardian, Victorian, Regency and Georgian. Alternatively, we also offer Bespoke Plaster Mouldings services and can create something truly unique, designed to suit your own property and tastes. 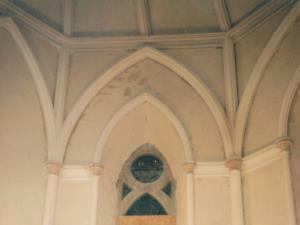 For examples of our Plaster Moulding Restoration work, please take a look at the Photo Gallery page. In Person: See our Workshop page. From our Workshop in Fleetwood in Lancashire, William Wilson Architectural Mouldings Ltd have good links to the motorway network and operate throughout the North West of England. We can supply, fit and restore plaster mouldings to homes, businesses and historic buildings in: Accrington, Barrow, Blackburn, Blackpool, Bolton, Burnley, Bury, Carlisle, Chester, Chorley, Cumbria, Fleetwood, Garstang, Kendal, Lancaster, Leyland, Lytham St Annes, Morecambe, Oldham, Poulton-le-Fylde, Preston, Skelmersdale, Southport, Thornton-Cleveleys, Ulverston, Warrington, Widnes, Wigan, Wilmslow, Windermere, Wirral, and more!